A variety of railroad workers help ensure that passenger and freight trains are in the right place at the right time, operating safely. Rail yard engineers —also called hostlers— move locomotives between tracks to keep the trains organized and on schedule. They drive locomotives to and from maintenance shops or prepare them for the locomotive engineer. Some operate small locomotives called dinkeys. Other railroad workers focus on train safety. Brake operators help couple and uncouple train cars. 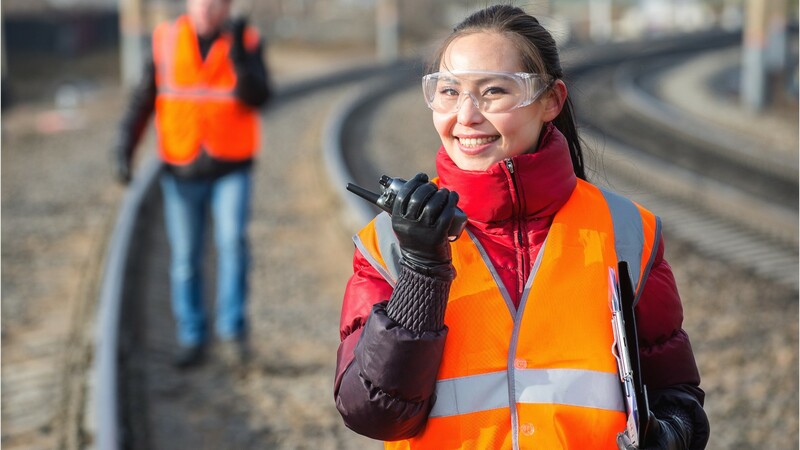 Signal operators install and maintain the communication signals along tracks and in the rail yard. Switch operators control the track switches in rail yards to ensure trains move safely between tracks. Locomotive firers monitor train instruments and watch out for hazards on the track. Most rail employees work full time. Since trains operate 24/7, many railroad workers work nights, weekends, and holidays. Rail companies typically require a high school diploma or equivalent, and provide on-the-job training lasting from a few weeks to a few months, depending on the employer and the complexity of the job. Rail yard engineers, and switch or signal operators may advance to become conductors or yardmasters. Locomotive Firers by U.S. Department of Labor, Employment and Training Administration is licensed under a Creative Commons Attribution 4.0 International License.